According to scientific geniuses (who poo-poo Creationism), human life did not originate from God or even the Big Bang, but...now get this..."by a dirty snowball tossed to earth from space." Direct news quote as given by scientist. Let's take a moment to readjust our glasses. Yesterday (9/17/13) the Contra Costa Times headlined this story on page B4: "Icy Comet May Have Caused Life on Earth." Really? The scientific wonders at Lawrence Livermore Lab (that designs nuclear bombs) stated to news media that "amino acids were the building blocks to life, which came to this planet upon which we now live, as a dirty snowball thrown at earth from space." "It was the icy comets that produced the gooey snowball that hit the earth," said they, "bearing carbon dioxide, methane, ammonia and other trace gasses, precursors to amino acids." Still with me? Not sure I am at this point. "All the raw materials and resulting pressure and high temperatures can drive the chemistry," the scientist proclaimed,"then those molecules were ORGANIZED into life's essential structures, and DEVISED a means to survive and reproduce themselves." Nir Goldman, chief brains of climate at the lab concluded by stating, "These results present a significant step forward in our understanding of the origin of the building blocks of life." So there is no God who created the earth and us. Believing in God is illogical, saith the scientists. Their theories, however, including snowballs from space that produced life are not illogical. Glad that is finally cleared up. So we just happened after the earth was hit with a dirty gooey planetary snowball, and here we are. At last we have all been enlightened. LEASE A SPOUSE? Helen Trautman, CEO of Results Unlimited in Pittsburgh lost no time in bringing to our attention a new idea, to not wed, but..lease a spouse instead. A lawyer,Paul Rampell, in all seriousness, promoted this in The Washington Post and Pittsburgh Post-Gazette (8/20/13). MilesTones wonder if a deposit is required upon signing the lease to cover any damages and repairs to the things leased. In the swank area of Danville, California, wild pigs have invaded the area tearing up lawns, expensive lawns at that. Neighbors were able to get big traps from Animal Control. The pigs wouldn't go near them. Dummies! Not the pigs but the ones who bought the traps that have a warning sign over them stating for all to see: "CAUTION...Pig Trap...Do not come close!" Pigs ARE more intelligent than people think. WHAT DID AL CAPONE AND PRESIDENT ROOSEVELT HAVE IN COMMON? A bit of history that not many folks know. Hours after Pearl Harbor on December 7, 1941, the Secret Service found themselves in a bind. President Franklin D. Roosevelt was to give his infamy speech to Congress the next day, and although the trip from the White House to Capitol Hill was short, agents weren't sure how to transport him safely. And run properly it did. Capone's car was a sight to behold. It had been painted black and green so as to look identical to Chicago's police cars at the time. It also had a specially installed siren and flashing lights hidden behind the grille, along with a police scanner radio. 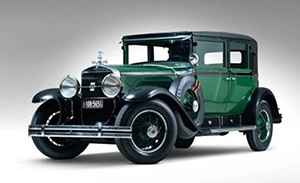 To top it off, the gangster's 1928 Cadillac 341A Town Sedan had 3,000 pounds of armor and inch-thick bulletproof windows. Mechanics are said to have cleaned and checked each feature of the Caddy well into the night of December 7th, to make sure that it would run properly the next day for the Commander in Chief. Our thanks to Rev. Ed Berkey (Retired) for sending the photo of the car and fascinating information. Now time for another long walk. Photo Caption: Al Capone's Car Driven by Whom?